Please forgive me if my terminology is a bit off, I'm posting this as I uncover this problem, and my FSM was foolishly wiped with the rest of my computers memory. I took my Z on a drive today, but didn't get far until I heard some evil coming from the rear end. It turns out that my passenger side half shaft (I can never remember if they are technically CV or half shafts) has dislodged itself quite a bit from where it seats in to the differential. I pulled it out. There appears to be no damage, but the question remains... How did this happen? Is there supposed to be some sort of circlip at the end of the spline assembly, in the notched groove? 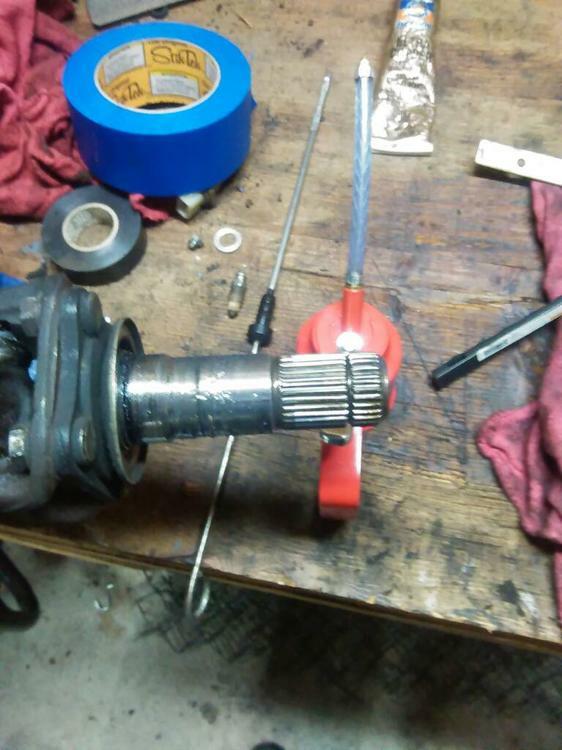 I've never removed the spline from the differential, however about a year or so ago I replaced the half shafts with some that had less miles on them. I thought the original ones were clicking, but it turns out that noise was from the rear brake pad pins not being installed properly. I still have my original half shafts. The car is a stock 1980 ZX. R180. I've tapped the spline assembly back into the differential until it is flush with the casing. I will Re install the original half shaft, test drive, and Re inspect. I don't know what it is called either but it is basically spring ring that holds the shafts in the diff. That spring ring might have worn to the point that it is not holding as well as it should or it might have cracked in two and fallen to the bottom. Those spring rings are still available from Nissan, at least they were two yrs ago, I would pull both halfshafts and investigate and replace both rings. Thanks. I'll do it. I drove the car for about 20 miles just now and Re checked the shaft. It appears to be holding in place, but without the spring rings, it sounds prudent to pull them both and find the rings. I think that it's called a "circlip". Circular clip. 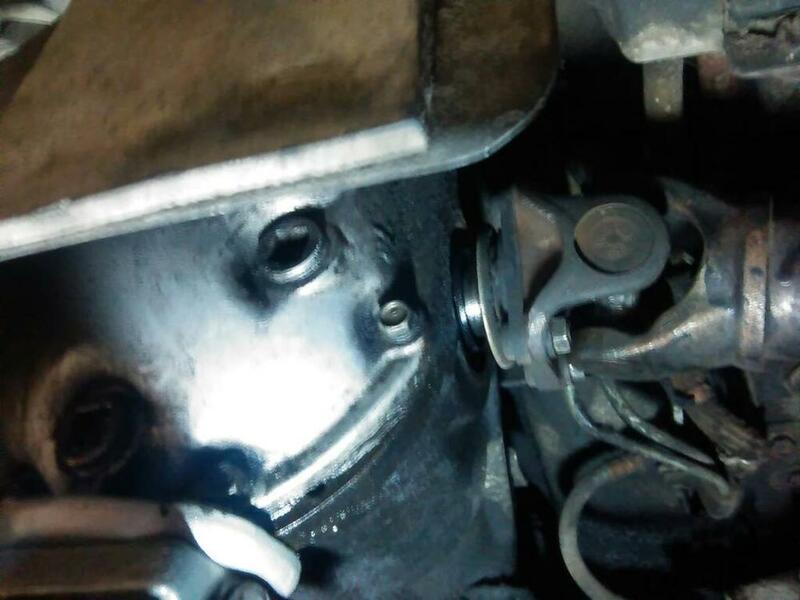 If you didn't seat the clip in the groove the last time that you installed the half-shafts (that's what we tend to call the u-joint "drive " shafts [which is what Nissan called them back then] then the axle might have been loose and worked it's way out. Or, as grannyknot said maybe it's just worn out. Usually it takes some serious effort to remove the axle from its clip. I use an oiled chisel face myself to wedge it out. They should be very tight. The clip is in the diff. Reptoid, I had the diff out of the car at the time for reconditioning and to have a limited slip unit installed. I took the diff and all the new parts to a Differential shop and I remember the mechanic telling me had a hell of a time installing the new circlips because the spring action on them is so strong. So just be aware that this might not be a job that can be done with the diff installed in the car. I will proceed with caution. Thanks for the fore warning. I have a spare differential, with the same issue,, passenger side is out, drivers side is in there tight. It's from an '82, and the splines are shorter than the '80 differential. I'm not sure I can use it, but I can use it to see how bad the circlips are to install. Nissan does still show them available 38225-N3100 Side Gear Circlip $2.54 each. Finding the old ones or pieces thereof might be more of a challenge. I wonder if I can find or make a sort of flexible shaft with a magnet at the end to send into the drain hole and sides with the shafts removed. Realistically however, I'm sure ill be removing it completely from the car and pulling the rear cover on the bench. That rubber bushing at the rear of the differential is worn anyway. I drove it, after hammering it lightly back into place and it does remain in place, but I'll bet money if I went and pulled hard it would come right back out. 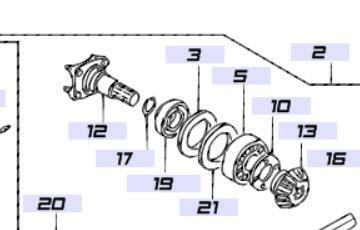 I have a spare differential, with the same issue,, passenger side is out, drivers side is in there tight. It's from an '82, and the splines are shorter than the '80 differential. Edit - the R200's are. Maybe the R180's aren't. 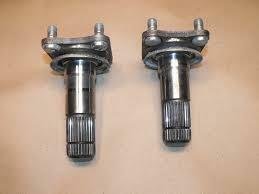 The diff axles are different length, left to right side. If you had two short ones in your diff, one of them won't lock in. Shouldn't be any difference in axle length by year. Looks like you have spare parts. Maybe you got some mixed up. Maybe you got some mixed up. This is quite possible. At the time of removing and replacing the half-shafts, I recall marking a "D" and "P" to distinguish between driver and passenger side, which still exist to this day. However, that doesn't mean that they didn't get mixed up before I marked them. I have a beer drinking buffoon of a friend who was present that day. Although I wont rule out the possibility that I just spaced out and installed the wrong side half-shaft. Just to recap the current configuration: I now have the original half shafts installed in their original position. The half shafts that I installed a last summer are on the workbench, and are the same length. The original half-shaft "telescopes" or extends further than the newer half-shaft, the one i pulled out last night. Maybe the half shafts i used to replace the original ones were the same length, and wrong in the first place, in other words, two left side shafts. This all makes quite a bit more sense now, as I look at the spare differential on the floor. I can see how the casing is not asymmetrical requiring one shaft to be longer than the other. Just to be specific, I'm talking about the half-shaft, not the spline/axle that should require a great amount of force to remove. Just to be specific, I'm talking about the half-shaft, not the spline/axle that should require a great amount of force to remove. Pretty sure he meant the half shafts. The half shafts from another car appear to be the same size. However, they don't extend all the way. The ones that were in the car when I got it extend further. I believe this means something is wrong with the half shafts I installed last summer. I've never removed either spline until yesterday when I discovered the right side dislodged/coming out. I don't remember what I could've done wrong that day. Surely something. I probably have no business working on this thing myself haha. My memory is turning to mush. Anyway, it's back to its original state now, and soon I will investigate how to get the circlip out and install new ones. I have a beer drinking buffoon of a friend who was present that day. Over time the half shafts can seem to have less range of motion due to the packing of the grease in the shafts. I documented the disassembly and the myth busting of various sized half shafts. They are all the same. Take them apart, clean them and reassemble. Very straightforward. Many thanks.. I remember following that thread, don't know why i didn't access it earlier. I'm going to get started after I help the kid with her homework. Sunday is my Saturday. The grease inside the half shafts can contain lead, so be mindful. Especially if you have little ones around! Do these halfshafts make a clicking noise at low speeds when driving straight when they are starting to fail? I have installed my spare diff('82 R180). Earlier I stated that it was missing a circlip, but I was mistaken. Both axles took a tremendous effort to remove. So much that I ended up taking it to a local shop to have them removed. Installed new ones and re-sealed. Also I've just replaced the front and rear shocks along with Eibach lowering springs from motorsport(a major improvement in handling) I have replaced both inner/outer tire rod ends w/new adjustment sleeves, although highly unlikely to be the cause, but worth mentioning. Rear wheel bearings replaced about 3 years ago. No noticeable groan or dragging noises typically associated with wheel bearings. Still need to have it aligned, so I haven't taken it on any long drives, just around a bit to test. 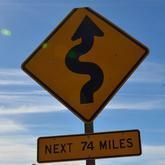 The clicking seems to occur after having been driven for roughly 15-30 minutes, and only noticeable at around 5-10 MPH. I verified that other noises simply weren't drowning out the noise at speed by running various speeds on a nearly empty road with minimal traffic noise. Exhaust is not loud. Cannot reproduce the noise with the rear jacked up, either with only one side jacked up, or the entire rear jacked up. This problem existed before all of the above mentioned work was done, and the current halfshafts in the car now are what were installed when I got the car..possibly original. A similar, but unrelated noise was found to be brake pad pins not seated/installed properly by me from years ago. What type of brake rotors are on the car? I have found that drilled or sometimes even slotted rotors can make sounds like this at low speeds. OEM style Raybestos brand rotors with metallic pads.